a bit grainy, I could run another preset then Default. Is this SU Podium or ProWalker? looks like Su podium. 1. Update your Nvidia driver constantly. 2. use denoise if you are not, 3. increase the sample rate to improve final quality. If this is SU Podium, that's sunset is impressive considering you are not using V2.6 which has HDRI/ IBL lighting. So you are using Skydome with sun on the horizon? I think so if there's a way to control the QMC preset so it keeps going for as long as you want. Big Stick - is there a way to lift the time throttle on QMC? QMC is a preset with no irridiance caching...I think the same thing as path tracing. But we put a time limit on how long Podium will render, so you obtain noise especially in an interior. For this ProWalker image, I'm using PR which is unbiased path tracing with Iray's denoiser which is amazing. So you can achieve the output very quickly. But as you can see, I had to turn the monitor screen LEMs off. So LEM rendering is a bit different from Podium's. Oh I forgot, BigStick is on his 30th wedding anniversary for the weekend so won't be on the Forum much for a few days. Dave, This is made with SU Podium. And I used a skydome with a setting sun. Hmm, this looks like it still has ceiling LEMs. If so - they are too powerful. The top of the wall would be slightly darker than the bottom. I'm not sure which preset you are using because you have turned the render info bar off. Dave, the QMC presets fire a specific number of photons so it's not time limited as such. We could raise the number of photons though. Problem is - we either produce a number of different presets with different limits, or we expose this number in the UI. The number of presets we already have is getting difficult to manage, which is more complicated for customers. We might want to review this. the last render was with a Interior Default preset. there's indeed a LEM under the ceiling; power 2. So in the next render I turned off the LEM, omni lights are still the same at a 0.80. I now used a 2_interior_bright_default_2_HDR preset. The outcome is pretty dark since I don't want to use any significant daylight. So am I missing something in setting up this scene, I mean what can I do more to lighten up the scene? You mentioned that renders better can be darker than lighter if you want to PP, I get that. I included the HDR file from this latest render; can you turn this into a acceptable picture? The point of HDR presets is that you use PP to lighten the image, because the dynamic range allows better, more even adjustment. You can see with the blotches behind the bookcase, that you need higher quality. You need LEMs in those recessed ceiling lights - not omnis. These are a bad choice for that type of (i.e. linear) fitting. Better ways of brightening the scene are a large (slightly smaller than the wall) low power LEM behind the camera, and large low power invisible LEMs outside the windows. Make them the same size as the windows. I took your above .hdr image and opened in the new PIE in V2.6 Beta and applied Adaptive Linear to the .hdr image. I did nothing else. If you like the overall interior lighting, I would do this in interior_high_HDR and save as an .hdr image. Then open in PIE V2.6 and immediately you will get an option to add adaptive linear which illuminate the image. There's still noise though. And the edges where wall and ceiling and wall and floor meet have artifacts. You can get rid of those with _high preset. But not sure what to do with the noise. 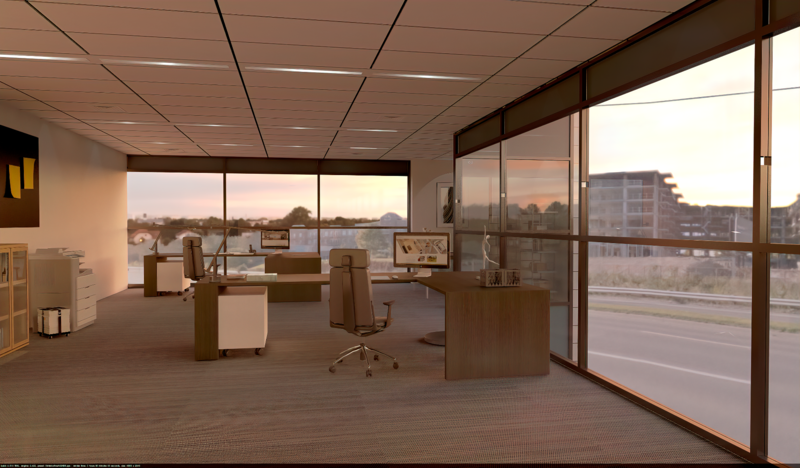 I guess I'm pushing the envelope wanting a interior render with a sunset. and it's my lack of capabilities, even in photography it's difficult to get such a result. But the most of my customers wouldn't notice that there's a LEM below the ceiling. The best result are still LEM's outside of the windows. you can get a sunset sky with the V2.6 or with ProWalker GPU. The problem with V2.6 is you must use fine_AA to remove the noise that the IBL background light uses. And the noise tends to be worse for interiors. I think I have your model. I will give it a try. In this version I took out the hidden LEM because the Hidden LEM was casting a shadow back to the ceiling. Here is a version using podium V2.6 beta1. Using one of the Sunset HDR backgrounds for lighting. The first image is using interior_fine_AA_HDR.hdr, then saved as .png. I used Denoise from Topaz to take out some of the noise. thanks Dave for the effort. I really appreciate it. 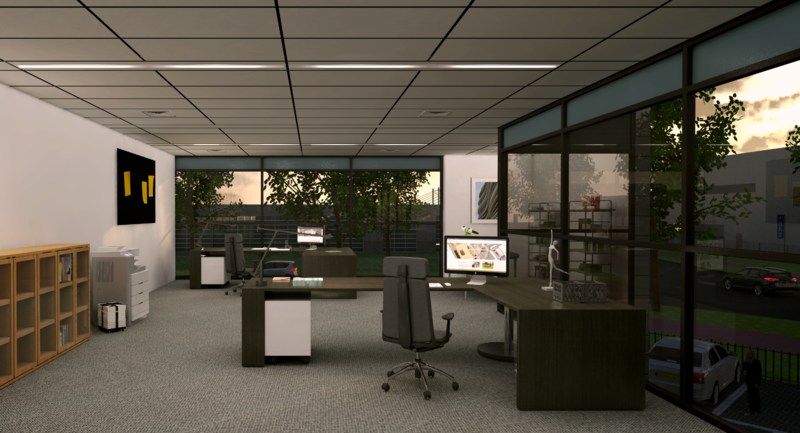 It does give a nice sunset feeling, but if I want to show a workable office situation I have to put in some artificial lighting. I will give it a go soon. The biggest issue for me with all these renders, even the best ones, is the configuration of the lights. Quite simply, linear fittings should never use omnis. These should have LEMs behind the diffusers. Fittings like this are designed to create an even light and the diffuser ensures that there is a plain rectangular glow from below. They are not supposed to have any falloff towards the ends. These are from our Browser and they are not configured as they ought.